Susan Hill's Gothic ghost story, adapted for the stage by Stephen Mallatratt, is set in an isolated windswept mansion with tragic secrets hidden behind its shuttered windows. There, a young lawyer encounters horrific visions in the house set amidst the eerie marshes and howling winds of England's forbidding Northeast Coast. With just two actors, The Woman in Black offers audiences an evening of unremitting drama and sheer theatricality as they are transported into a chilling and ghostly world. "...The show now at the Royal George - and how great to see this long-dark venue lit up again with terrified faces - is actually directed by Herford. So you might think of this as a chance to see the West End production of "The Woman in Black," only without the cost of the plane tickets to London. And with the added benefit of two Chicago-based actors in Adam Wesley Brown and Bradley Armacost, a venerable, grizzled Chicago star who adds all kinds of rooted pain and rich complexity to this scary yarn. This might just be a ghost story, but Armacost does not mess around with the mortal truth." "...For a show that's been running in the West End since 1987, the late Stephen Mallatratt's adaptation of "The Woman in Black" feels surprisingly of these times. At least in some ways. The play itself is the opposite of cutting-edge, deriving much of its charm from being forthrightly old-fashioned: Just two men rehearsing in an empty, turn-of-the-century London theater. Much like it's source material, Susan Hill's 1983 novel of the same name, Mallatratt's "The Woman in Black" is an immensely pleasurable exercise in Gothic cosplay." "...The small cast (another plus for a producer looking to contain expenses) provides actors with plenty of opportunities to chew the scenery. In the current production, Armacost reveals what a true chameleon he is, playing one minute a stuffy and dull accountant, the next a grizzled old codger, and a prickly local character the moment after that. This is also a show where much depends on strong lighting and sound design; Kevin Sleep (lighting) and Rod Mead (sound) do not disappoint. Every element of this fine production contributes to this stage thriller that actually thrills." "...It is great to see the main stage at The Royal George Theatre back �in business � again! A beautiful venue with great sight lines and very comfortable seating ( with leg room) that deserves more use. When Hershey Felder was doing a new show every year, this was the home he chose, and based on my knowledge of his works, he only will use a venue that he feels will allow the audience to see all that happens on the stage. 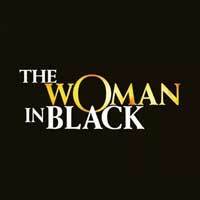 The current production, �The Woman in Black�, as directed by Robin Herford, proves this to be an accurate statement." "...I didn�t actually shriek in fear�at least I hope I didn�t�during �Woman in Black,� but I had my share of gasps, starts, shudders and, during the second act, an embarrassing, adrenaline-induced muscle spasm that ran from knee almost to shoulder. If this is your idea of holiday-time merriment, then by all means see this two-man (plus ghoul) show, a touring version of a production that has run for almost thirty frightening years in London." "...Audiences are finding themselves lost in the foggy, supernatural world of eerie apparitions and things that go bump in the night. Theatergoers searching for something completely different for their holiday entertainment and beyond, should look no further than this delightful, surprising and totally captivating melodrama. All of this, thanks to a frightening, shadowy specter, the mysterious, ghostly Lady in Black." "...In the end, it's not a crazed Freddie Krueger figure slashing that makes "The Woman in Black" so gloriously chilling, but the power of the unseen, the barely seen, and the aura of menace we think we understand, but maybe not. The tension is palpable and beautifully paced. This kind of theater outwardly may seem trivial and melodramatic, but it's an art form, especially when it is as literate and riveting as the Hill-Mallatratt fright machine. All in all, very scary and great fun." "...The play is a thriller, with many of the chills delivered the old fashioned way, through lighting, sound and props. It falls within the bounds of comfort for more sensitive viewers (like my companion) who will find it just below that threshold of covering-the-eyes scary). It's also hip enough to appeal to young adult audiences, who filled a third of the seats on opening night." "...The Woman in Black, a spooky Christmas transplant from the UK, is the second-longest running play on the West End (the top spot belongs to another little potboiler, Agatha Christie�s The Mousetrap). The play has run for over 30 years, and is being staged for the first time in the US by original director Robin Herford, courtesy of PW and Pemberley Productions. I�ll get down to brass tacks, because first and foremost you must be wondering �Is it scary?� The answer is, yes. In fact more so than any play I�ve seen that attempts such an exercise. It would seem that the Brits like their winter solstice served up with some well-earned jumps and screams." "...The Woman in Black is probably a perfect date play, but I noted several families with teens in the audience when I attended who seemed to be enjoying it tremendously. No matter who you are, this creepy story will frighten and entertain you in equal measures. No matter what time of year it is, a good ghost story is a good ghost story. And a great play is a great play." "...The most tantalizing and simultaneously terrifying aspect of this production is that nothing is what it seems. The set starts out unassumingly as a dusty old curtain, a woven basket trunk, some chairs, a stool, and some old furniture covered in sheets. By the end of the show, the sheets are both literally and metaphorically pulled away, revealing a complex and brilliantly creative collaboration between every part of the design team. Throughout the show, the audience is transported into a bog in a foggy marsh, a causeway through the ocean under a blanket of starlight, and a joyous street festival, not through extravagant efforts, but organic and genius stagecraft. The audience is asked to suspend their disbelief, and this humble reviewer is extremely glad he did."